Anse Chastanet Resort is a 600-acre estate on the Caribbean island of St. Lucia, surrounded by white sand beaches and lush vegetation. This unique getaway offers a large number of activities, including a SSI Platinum Pro/PADI dive facility, jungle biking, kayaking, yoga, spa treatments, escorted boat snorkel trips, tennis, horseback riding, weddings and romantic sunset cruises. Jade Mountain is an all-suite hideaway within the resort, offering stunning luxury suites with private infinity pools. The 49 individually furnished guest accommodations are set either on the hillside or just steps from the water. High up on the hillside, rooms and suites offer postcard-like views of the Piton mountains and the surrounding sea from their wrap-around wooden balconies. If you want to be closet to the ocean, ask for one of the beachside guest rooms surrounded by a tropical garden. It seems that far to often romantic poolside vacations are interrupted by all of the issues that come with going to a crowded hotel pool. The Infinty Suites eliminate any such issues by simply putting a private pool right in the living room of your suite. These make great honeymoon suites (starting at USD $900 per night) for couples looking for a luxury getaway. The 24 Infinity Suites are located on the highest point on the hill and have a bedroom, living room and a private infinity pool. Each of the suites only has three walls to allow for unobstructed views from the high vantage point. As an added bonus the suites have their own concierge, reception area and a restaurant. Kai Belte Spa was designed in harmony with nature. Choose from Swedish massage, aromatherapy, reflexology and Ayurvedic treatments. If you are planning a honeymoon, the spa offers treatments and spa package designed especially for couples. Kai Belte Spa uses custom products made with cold-processed French herbal extracts with essential oils, Swiss bio-extracts and naturally derived water-based emulsions. St. Lucia is a romantic wedding destination, offering couples a unique selection of wedding services and stunning accommodations. Each ceremony is organized in personal consultation with the bride and groom. The bride and groom get to choose their own "very special location," which can be on one of the two resort beaches, the "Miss Ina," the old colonial plantation, a nearby waterfall, the coral reef or the privacy of their room. Guests can set out in Prijon sea-kayaks with trained guides for coastal kayaking adventures. Prijon sea kayaks feature rudders, ergonomic seats, knee braces, and carbon fiber paddles. Kayak trips explore the volcanic cliffs and isolated beaches of the southern coastline. Escorted kayaking adventures for experienced kayakers are also available. Guests looking for an easier kayaking experience can go for a ride in the resort's complimentary ocean kayaks. Scuba St. Lucia was founded in 1981 and is a SSI Platinum Pro, Padi Dive Center and DAN Partners in Dive Safety facility. The facility is located on the beach just below the hotel. Steps away from the main facility is the reef which is part of the Soufriere Marine Management Area (SMMA). Guests are required to begin their scuba diving vacation with a shore dive for orientation purposes. Unlike many basic check out dives, the reef has much to offer divers of all levels since it is home to over 150 species of fish and is a great place for underwater photography. Night dives are offered at least twice per week on the reef. All dives are guided by one of the instructors/dive masters to maximize diver safety and enjoyment. The cost is $35 for a single dive, $175 for a 6-dive Package, and $250 for a 10-dive package. Many resorts offer mountain biking as an activity, but this usually means that they have several bikes for rent and that's it. At the resort, you will find 12 miles of biking trails and a skill course training area right next to the 5,000-square-foot Bike facility. Bike St. Lucia is located in the Anse Mamin Plantation which is part of the 600 acres that belong to the property. Riders head out to explore the trails on one of 50 Cannondale suspension bikes. There are trails for everyone from beginner to expert. Riders can explore 18th century French Colonial ruins, visit the hilltop site of an old estate or see a 3 million gallon reservoir. Rental of a Cannondale F800 mountain bike costs $39 for 2 hours, $49 for 1/2 day, and $69 for a full day of biking. Anse Chastanet Resort offers several stunning restaurants, including the Treehouse Restaurant which consists of two open air treehouses with ocean views. The vegetarian restaurant Emeralds uses locally courced ingredients and produce from the resort's own gardens. The Trou au Diable beach restaurant lets you dine right on the hotel's sandy beach. The hotel serves a special Indian menu with Caribbean influences. The Jungle Beach Bar & Grill, set on the resort's second beach, Anse Mamin, serves casual lunches in a relaxed setting. Fly into St. Lucia and let the resort arrange for a car to meet you at the airport. Taxi transfer each way is about US$60 (1-2 persons) from Hewanorra Airport and US$85 (1-2 persons) from George Charles Airport. 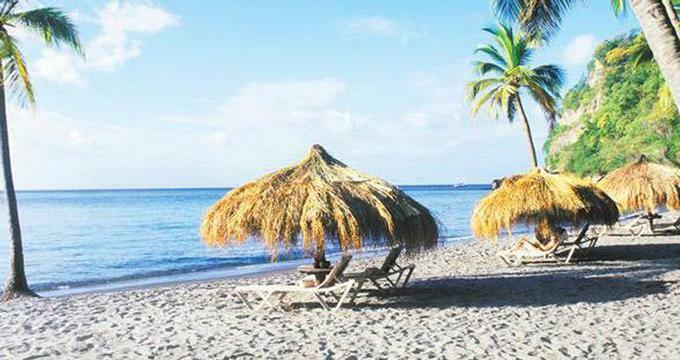 Whether you are looking for adventure, a relaxing vacation on the beach, spa treatments or family discounts, hotels and resorts in St Lucia offers great vacation packages and deals. You will find free nights, spa credits, romantic sunset dinners and other specials. The Total Romance Package at the Anse Chastanet starts at $4,171 for 3 nights and includes all tax and service, airport pickup, breakfast, lunch, afternoon tea and dinner, drinks, tour of Volcano and other tours. Guests receive free water equipment, a guided snorkel trip, scuba course, a massage, sailing and an anniversary certificate of US$ 500 to be used on a return visit. Jade Mountain is an incredible hideaway for couples, offering stunning pool suites with spectacular views. The Amazing Adventure offer at Jade Mountain costs $11,133 for 7 nights and includes: 7 nights, all meaks, all tax and service, airport transfers both ways, scuba diving, jungle biking, guided walks and use of water sports equipment. Rates start at around $330 per night for a standard room in the summer and $380 for a standard room in winter (high) season. The property also offers a number of packages on its website. Children under 4 years of age cannot be accommodated at the resort.